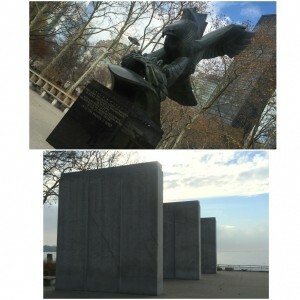 The first photo is taken by me, didn’t realize how dark it was so I added a better photo of the monument in daylight. Link to website below photo. 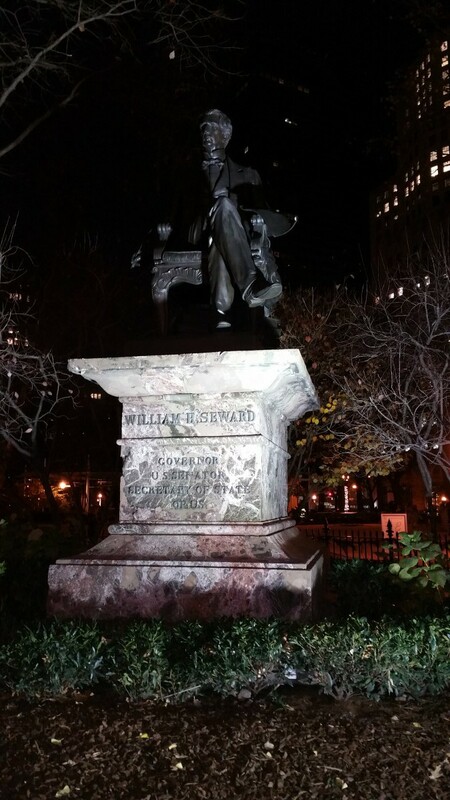 The above photos are of William Henry Seward taken from Madison Square Park in New York City. 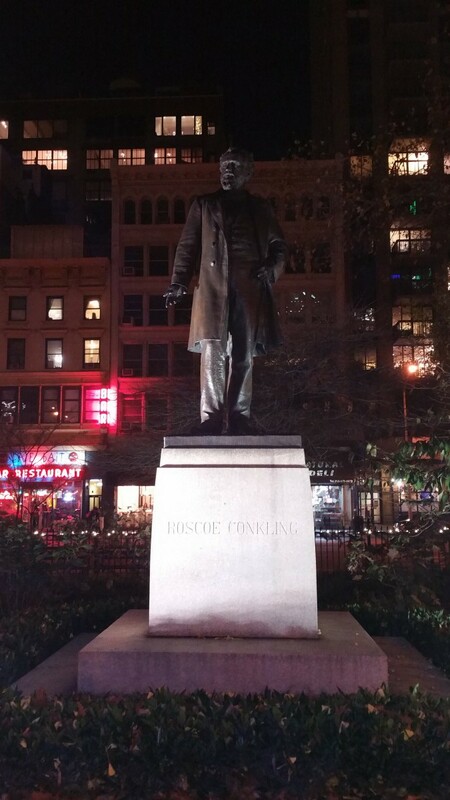 The statue is located on Fifth Avenue at 23rd Street and placed on a diagonal facing the intersection of Broadway and 23rd at the southwest corner of Madison Square Park. The sculpture portrait of the former Governor, U. S Senator, and Secretary of the State on a pedestal. The statue is made of bronze, red levante marble. The sculpture was dedicated in 1876 and William H. Seward is said to be the first New Yorker to be honored with a monument in the city. Seward was admitted to the bar at Utica in 1822 and specialized in patent law and was in great demand as an attorney in criminal cases. In 1845, he argued in defense of freedom of the press in a libel suit against a newspaper publisher. In addition to the statue of William H. Seward, Madison Square Park has several historical figures. Below is a photo of Admiral David Glasgow Farragut. 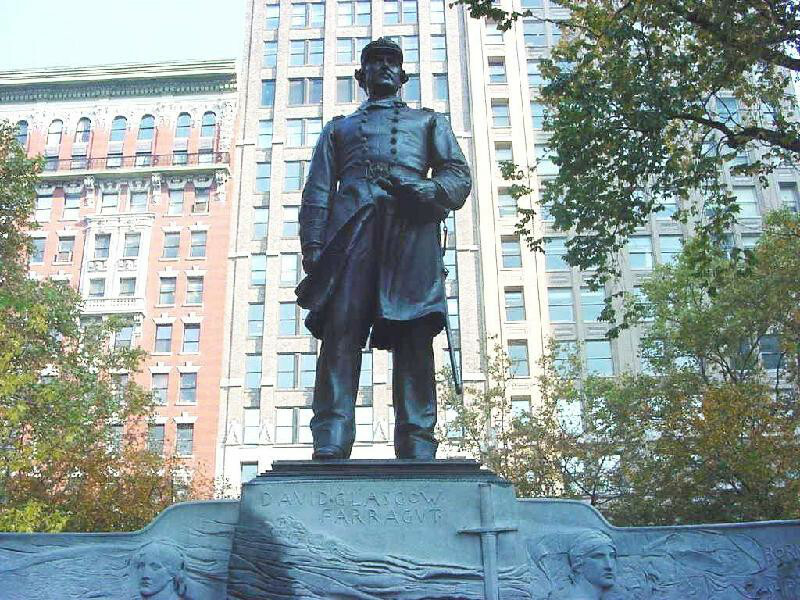 Admiral Farragut Monument is located at the north end of Madison Square Park, 24th Street between Fifth and Madison Avenues. This monument was sculpted by Augustus Saint-Gaudens and architect, Stanford White. The figure is over 9 feet tall and is made of bronze and coopersberg black granite. The admiral is standing on a pedestal in full uniform with binoculars in hand and sword at his side as if he is engaging in commanding a fleet. The architect, White designed the semi-circular exedra on which the monument stands; an extended place to sit underneath the statue. Overtime the monument has been revered for its dynamic naturalism and is one of the finest outdoor monuments in New York City. 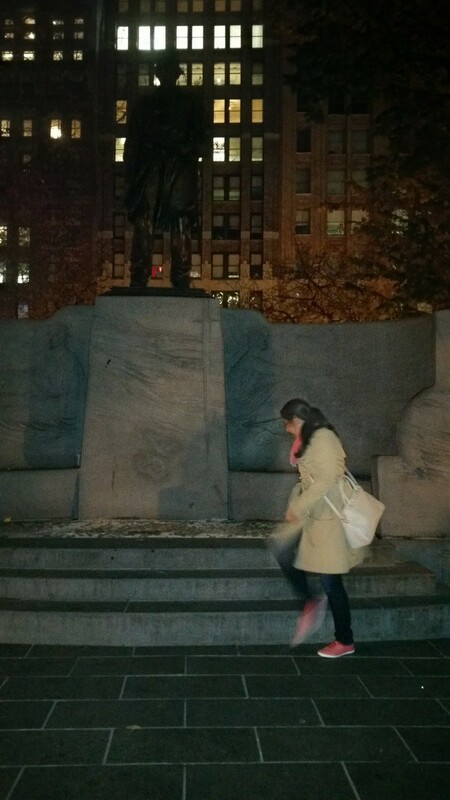 I didn’t know much about either Admiral David G. Farragut or William H. Seward, until I looked up famous monuments in New York City. But I did find a very interesting video on Admiral Farragut and the End of the Civil War: Gettysburg Winter Lecture (https://www.youtube.com/watch?v=T4ZMxzq8T58). The video contains a lot of information about the admiral and the story behind his famous quote. This entry was posted in Uncategorized on December 15, 2015 by JasmeetS. This picture was also taken in the city of Paris, France. At The Louvre at the biggest museum in the world. This trip that i did with my high school friends was well worth it, we backpacked through everything and visited as many places as possible. This picture was also taken approximately two years ago. This statue was discovered on the small islands of Samothrace in the northwest Aegeans, by a man named Charles Champoiseau. This statue represents the goddess of Victory. This statue says a lot, as she stands there on top of ships, braced against wind. She represents the special naval victories that she had given to the Greeks. She supposedly grants victory. The statue is called Nike in greek. The people of the museum tried to restore the statute of the missing pieces that was broken off during the excavation. However, they were unsuccessful. But, this was one of the best work of art at The Louvre. 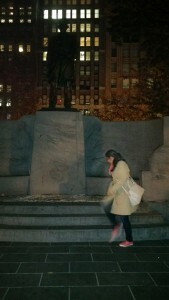 My refection to this statue was shell shocking. When i went to the museum in Paris i did not know all of the information. I feel like once you know what something is, you get a deeper sense of appreciation. When i first saw this statue in person i was amazed with the amount of craftsmen ship that was still preserved. People take art for granted, however there is so much more in the details. And this goddess was more intricate than it led out to be. I have such more appreciation for art now than i ever had before. This entry was posted in Uncategorized on December 15, 2015 by Parth. 2. The commemoration of William Shakespeare statue in New York City’s Central Park was built in 1864 to celebrate the three hundredth anniversary of Shakespeare’s birth. The southern end of the Mall in Central Park is often referred to as “Literary Walk.” William Shakespeare is being highly honored as one of the most widely read English authors, but also one of the most easily recognizable, with his beard, mustache, and oblong shaped head. 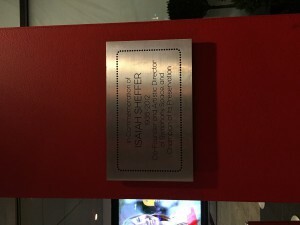 As a result, he has been commemorated and memorialized throughout New York City. 3. My reflections regarding William Shakespeare’s statue is that it grab my attention that th environment where the sculpture is situated it’s very relaxing environment, I was surprise to find out that The sculpture was donated by the citizens of New York, led by a committee to honor the 300th anniversary of the birth of the poet and dramatist in Stratford-upon-Avon in 1564. 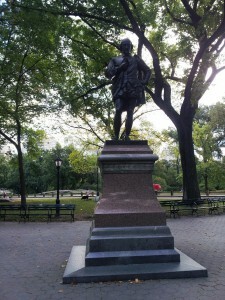 Shakespeare is one of four sculptures by Ward in Central Park. This entry was posted in Uncategorized on December 14, 2015 by erikaflores27. This statute was in Paris, France. Me and my high school friends had gone to Europe after graduating high school. This picture was taken 2 years ago, located at The Louvre. One of the biggest museum in the world and holds many different historic monuments. The sculpture was build between 130-100 BCE about a Greek goddess of love and beauty. The sculpture was found accidentally by Yorgos Kentrotas a young farmer in 1820. The hand of the goddess was lost during the discovery of the sculpture. The sculpture was founded buried unground, in the city of Milos. The significance of this sculpture is not only that it is an actual goddess, but instead that the sculpture was found a hundred years after it was made. In such condition, representing the history of the ancient greek culture. Which is why, to this day this sculpture sits in the biggest museum in the world with such high regards. The significance of this statue is something i do not need to say, it speaks for itself. In my opinion everyone should go to Paris and visit this museum. I think the Greeks are very proud to see a work of art being represented in the biggest museum in the world. Essentially, i was shocked to find out that a statue can survive over 100 years and still be in such good condition. Granted that the marble that the artist used was very strong and expensive, regardless it is still a miracle. This statue represents the history of the Greeks and there talent. This entry was posted in Uncategorized on December 14, 2015 by Parth. This head statue is of Washington Irving, located on 40 West 16 Street Irving Place. Washington Irving was an American author. He’s known for his writing of “The legend of Sleepy Hallow”. 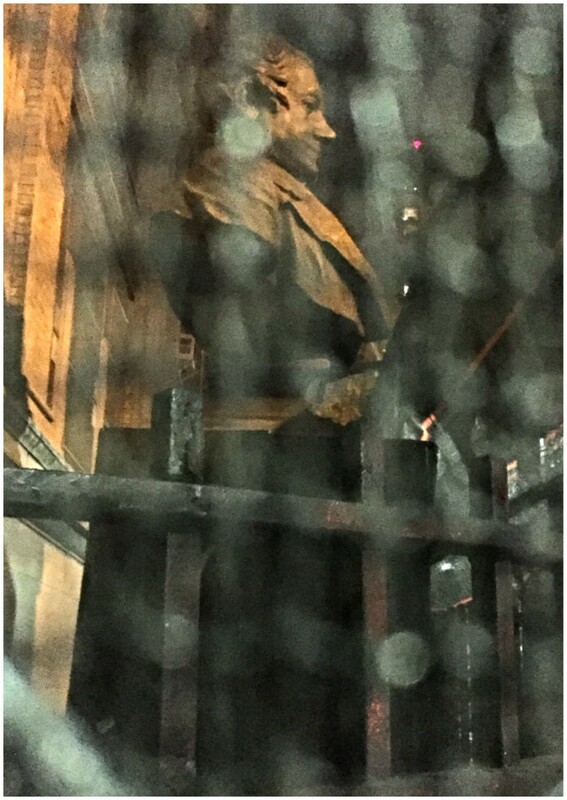 This statue is part of Washington Irving High School. It was an all-girl school back in 1902 with eleven floors. The school commemorates him for his writings. The school recently closed this past June as the last class graduated in 2015. The school remains open under a few different names. I graduated from Washington Irving High School in 2011. This statue always reminds me of the times I’ve had in the school and as well as the great stories I have read by Washington Irving. The picture did not come out so great because it was barricaded inside. I am assuming because the school was shut down and just remains open under a different name they will possibly remove the head statue. This entry was posted in Uncategorized on December 14, 2015 by Liza. This photograph was taken in Battery Park. 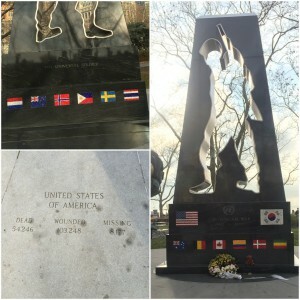 This statue is commemorating the soldiers in the military who were involved in the North Korean War which started June 25th, 1950. 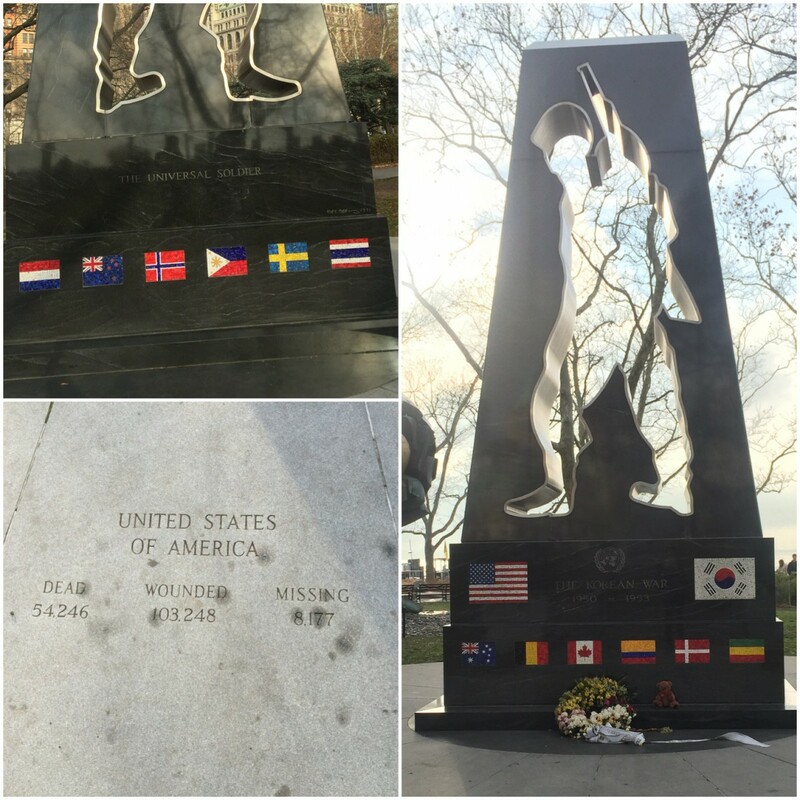 This memorial is dedicated to all the nations who participated from all around the world. The statue has flags all around the granite are to give dedication to the countries involved as well. I liked the way it is structured. When I took the picture someone left a teddy bear and flowers in the front of the statue to show the appreciation people have towards the people who participated in this war. This photograph was taken at Battery Park. 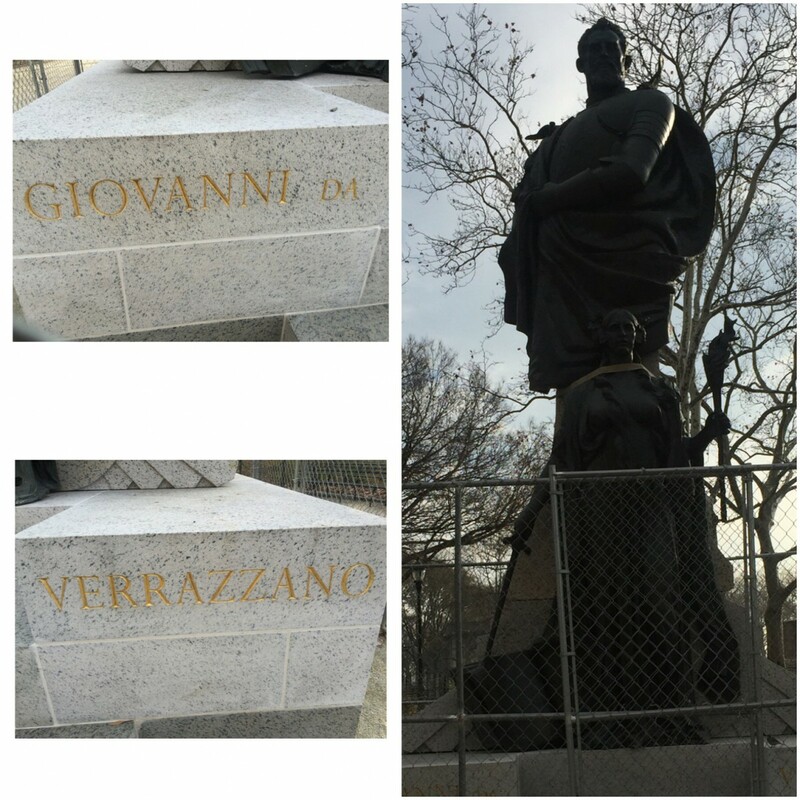 The Statue is of Giovanni da Verrazano who was an Italian explorer and navigator. The statue was built on October 9th Verrazano was born as Castello Verrazano in a town named Greve near Florence, Italy. Verrazano is being commemorated for his travels in being the first to stumbling into the New York Bay in 1524. He was in search of the Pacific Ocean and the Far East. I like how the sculpture is. The way Verrazano is posed showing that he is a man in control. I did not like that the statue is enclosed with in gates possibly for construction purposes. This image was taken at Battery Park. The statue represents the diversity of immigrants who have came to the United States. The statue reads “dedicated to the people of all nations who entered America through Castle Garden. In Memory of Samuel Rudin.” Rudin is the son of Jewish immigrants who came to the United States though Castle Garden. Rudins father bought his first property in 1905, a three story brown stone located on 153 E 54th street then advising his children to never sell the property and purchase buildings surrounding it. Rudin founded the Rudin Management Company which deals with leasing and managements of businesses. At his death, his children created a foundation in honor of Samuel and May Rudin. 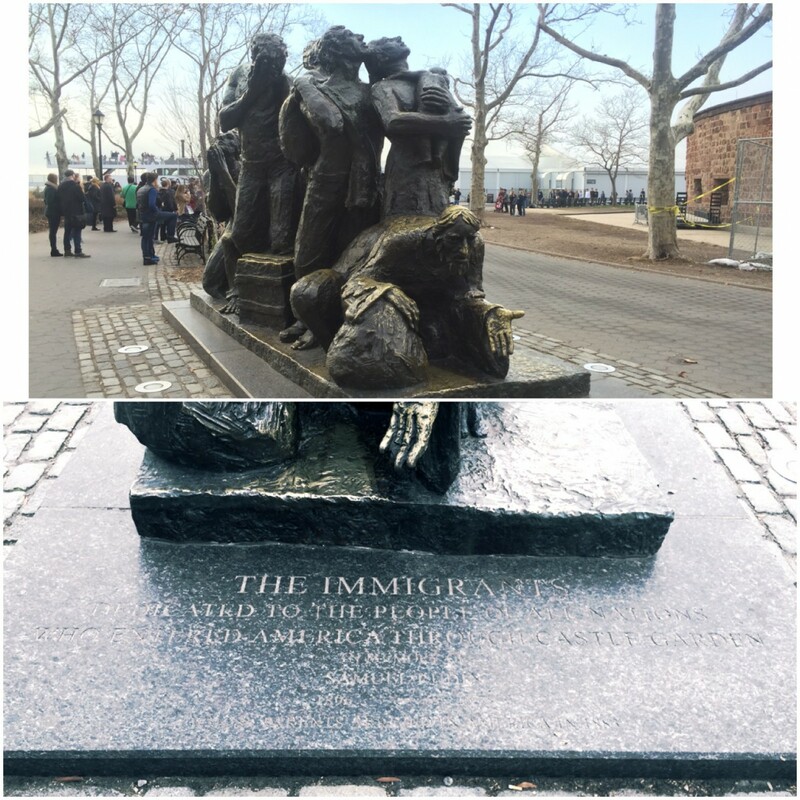 This statue symbolizes all the immigrants who have came into this country. My parents came into the United States as immigrants, my father from Cuba and my mother from the Dominican Republic. I understand the struggle immigrants go through to survive in NYC. The statue show people just looking as if they are wandering and some even praying as if their prayers were answered in coming here. This definetly gives off a strong message on how immigrants came and especially how they feel just by face expressions. The statue of the eagle and the walls with names on them honors the 4,601 missing American soldiers from the Navy who lost their lives battling in the Atlantic Ocean during World War II. The eagle has the dates of 1941-1945 representing the times the war was going on. The walls with the names are to commemorate all of the soldiers who passed in a special way. There are a total of six walls with names in both front and back of them. The eagle is facing the direction of the Statue of Liberty which makes it more symbolic to the American people. President John F. Kennedy and the federal government were the persons who funded this commemoration. This statue and the walls with every single soldier who passed is a very strong message. These people fought for America to be what it is today. These World Wars were important eras in U.S history. I took this photo right up the block from the elementary school I went to, PS.75. This is Symphony Space, a performing arts center located on West 95th street and Broadway. Personally I feel like its only right for the place to be commemorated after Isaiah Sheffer, after all he pretty much built this place from scratch. This entry was posted in Uncategorized on December 14, 2015 by Amina.